The American Heart Association grew out of a set of smaller groups. A primary influential group was the Association for the Prevention and Relief of Heart Disease, formed in New York City in 1915, to study whether patients with heart disease could safely return to work. Several similar organizations formed or evolved in Boston, Philadelphia, and Chicago in the 1920s. Recognizing the need for a national organization to share research and promote findings, the American Heart Association was formed in 1924 by six cardiologists representing several of these precursor groups. In 1957 the AHA issued a national report which included: (1) Diet may play an important role in the development of heart/artery disease, (2) The fat content and total calories in the diet are important factors, (3) The ratio between saturated and unsaturated fat may be the basic determinant, and (4) A wide variety of other factors beside fat, both dietary and non-dietary, may be important. By 1961, these finding had been strengthened, leading to the new 1961 AHA recommendations: (1) Maintain a correct body weight, (2) Engage in moderate exercise, e.g., walking to aid in weight reduction, (3) Reduce intake of total fat, saturated fat, and cholesterol. Increase intake of polyunsaturated fat, (4) Men with a strong family history of atherosclerosis should pay particular attention to diet modification, and (5) Dietary changes should be carried out under medical supervision. On October 28, 2009 the AHA and the Ad Council launched a hands-only CPR public service announcement and website. On November 30, 2009, the AHA announced a new cardiac arrest awareness campaign called Be the Beat. The campaign’s aim is to teach 12- to 15-year-olds fun ways to learn the basics of cardiopulmonary resuscitation and how to use an automated external defibrillator. In 2010 the AHA launched the “Go Red for Women” campaign. Historically men have been the primary subjects of heart disease and stroke research. “Go Red for Women” specifically targets women with information about risks and action they can take to protect their health. All revenues from the local and national campaigns goes to support awareness, research, education and community programs to benefit women. If you visit the AHA website (www.heart.org), you will discover everything is all about bringing awareness to heart health and preventing heart attacks, smoking dangers, CPR techniques and advice, stroke warnings & signs and so much more. No wonder so many of our customers prefer the American Heart Association for their charity donation. It touches so many lives. 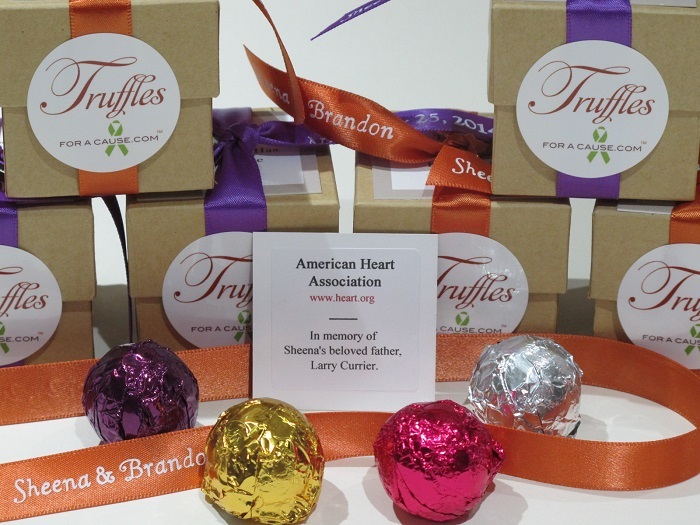 Sheena & Brandon’s charity donation went to the American Heart Association with a sweet special mention to Sheena’s father – “In memory of Sheena’s beloved father, Larry Currier.” The American Heart Association is well known for its work with heart health awareness, but sometimes what is not so well known is their health awareness concerning strokes – stroke warning signs, preventing strokes, treatment and life after a stroke. Their wedding favors were our Foil Assortment with 4 assorted flavor foil chocolate (dark, milk, amaretto and Irish cream), truffles inside. 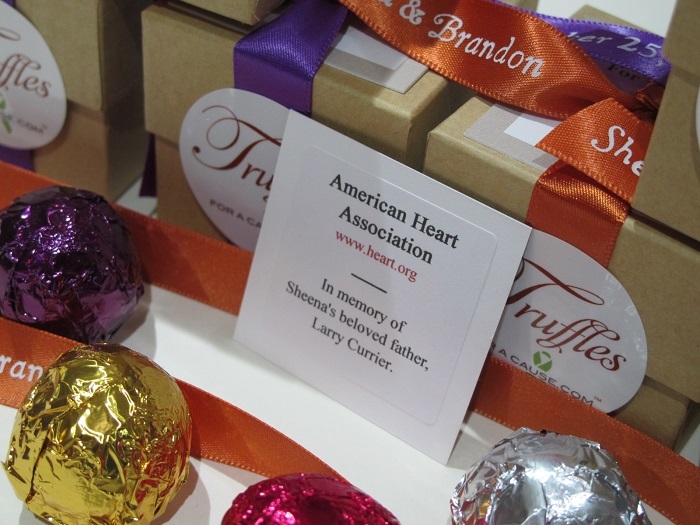 Their beautiful ribbons were purple and burnt sienna tied on natural Kraft boxes. Thanks for their great charity donation and good luck to them! 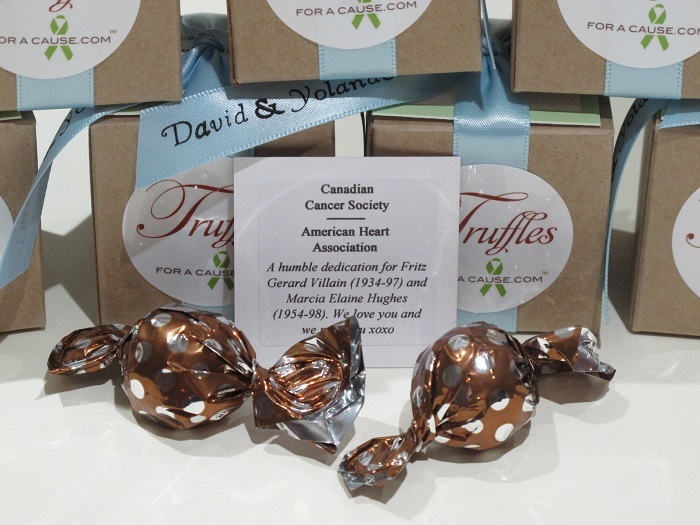 David & Yolande wanted their wedding favors (Option #3 version), to bring awareness to the Canadian Cancer Society which is the Canadian version of the American Cancer Society. It is a Canadian national community-based organization of volunteers whose mission is the elimination of cancer and the enhancement of the quality of life of people living with cancer. Their second charity was The American Heart Association which works tirelessly to reduce deaths caused by heart disease and stroke. 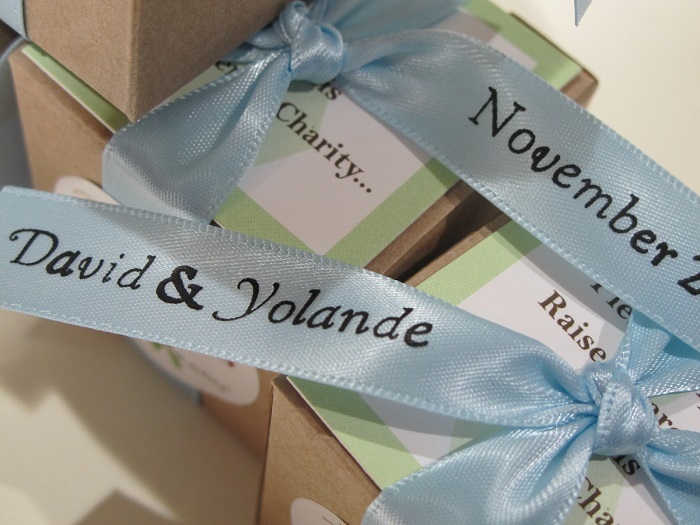 Their favors were our Caramel Twist with 2 caramel chocolate truffles in each natural Kraft box and their ribbons were light blue tied in our classic style. To learn more about the Canadian Cancer Society, visit their website. To learn about the American Heart Association, visit their website. Best wishes and good luck to them! One of their outstanding leaders was Jeanne A. Carpenter. She was a was a leading member of the Epilepsy Foundation’s board of directors for eleven years and a former president of the organization. Jeanne Carpenter was diagnosed with epilepsy following a generalized tonic-clonic seizure at the age of 23, fresh out of law school and ready for the rest of her life. Looking back, she realized she had probably been experiencing partial seizures for some time, but had been unable to secure a diagnosis or treatment from those entrusted with her care. Learning that she had epilepsy was a shock, and finding so little information available at the time only added to its traumatic effect. 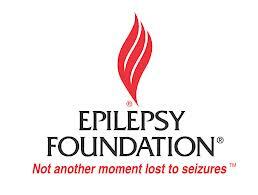 In fact, the only detailed information she could find at first was through the Epilepsy Foundation. Jeanne joined the EFA board in 1992 and her impact on the Foundation and its work was profound. She was always the first to pick up the phone when the media portrayed epilepsy in a negative light. She also believed strongly in the Foundation’s adopting vigorous advocacy positions on matters of public policy and legal rights. And yet behind all her success was the personal struggle of a woman who continued to have seizures and who had to come to terms with a diagnosis she never expected. She was very conscious of the fact that while her success might inspire others, there were many who faced problems that could not be so effectively overcome. The work of The Epilepsy Foundation and Jeanne Carpenter, are unwavering for those affected by epilepsy and support people with epilepsy and their families in communities all across the country. 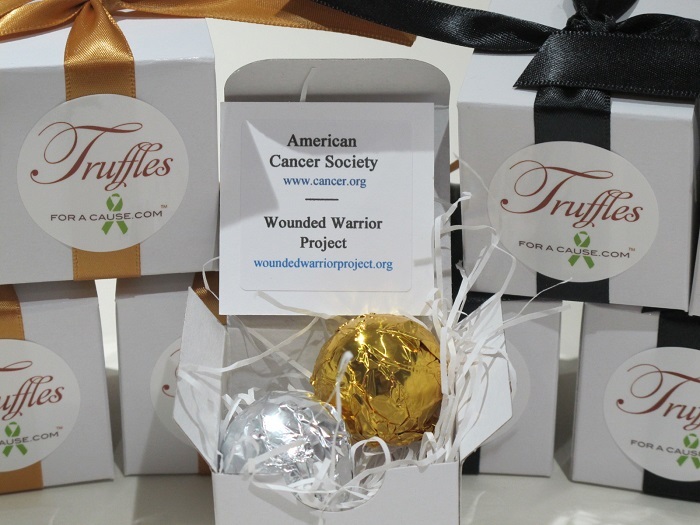 It’s gratifying to know that our favors help touch and bring awareness to such an important charity and cause. To learn more visit their website. Two of our most popular charities – American Cancer Society (On a mission to free the world from cancer) & Wounded Warrior Project (The greatest casualty is being forgotten), were the designated charities for Bonnie. Normally we would put these phrases for each of the charities, but because of the limited space on the charity sticker we can only put the name of the charity and the website address. Her chocolate wedding favors are our Foil favors with dark chocolate/silver foil and milk chocolate/gold foil truffles sitting on white shredding in the open favor box.. Her ribbons were gold and black. Congratulations and our best to Bonnie!